Former First Minister, Alex Salmond has announced his candidacy for the SNP nomination in Gordon constituency. "Almost twelve weeks ago I stepped down as First Minister. I said that I believed that Scotland could still emerge as a winner from the referendum process. “It is now clear what we have to do as a country in order to secure that progress; the progress which we were promised. “Three things are now self-evident. “Firstly, the Smith Commission has not measured up to what was promised. It is not proposing "home rule", "devo max" and still less "near federalism". It is real control of one more tax and a small proportion of welfare spending; it would leave Scotland still in the clutches of Westminster austerity. That is not Robert Smith's fault. It rather reflects the reality that the Westminster parties will concede to Scotland as little as they can get away with. It is up to us to ensure that they get away with nothing. “Secondly, the man who said he would stand guarantor of the vow has retired from politics, after describing the central proposal of the Smith Commission on income tax as a "Tory trap". Whatever Gordon Brown had in mind when he underwrote the Vow it cannot be, by definition, what has been offered and there is certainly no way now he can guarantee any delivery. 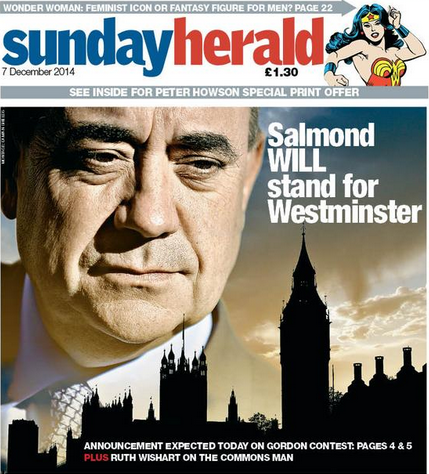 “Thirdly, the SNP and progressive allies can emerge as a powerful force in the next Westminster Parliament. Under our brilliant new leader, Nicola Sturgeon the SNP is now the only true mass membership party in these islands. No overall majority seems the most likely outcome of the Westminster elections and therefore the opportunity exists for Scotland to emerge from next year’s election in a commanding position. “In the weeks since the referendum the people of Scotland have refused to give up on the hope of a better Scotland. “For those who voted Yes the referendum offered the possibility of real change. For many who voted No they insist on the vow being properly redeemed. Mr Salmond also said he had no ambition to lead the SNP Group at Westminster and would if elected, for a year with a dual mandate for Westminster and Holyrood, donate one salary to a charity supporting local youth causes. “I have been First Minister of Scotland. I have no interest in titles and fully support Angus Robertson who is an excellent leader of the SNP at Westminster, a close friend and a fine MP. I am perfectly content as a constituency member of parliament and will seek to have a role in negotiating the progress for Scotland which would arise from a powerful group of SNP MPs and our allies. “If elected with a dual mandate for Holyrood and Westminster I will do as I have done previously and donate one of the salaries to support youth causes in the North East of Scotland. The Mary Salmond Trust has already used £100,000 in this way to excellent effect in supporting young people in our area and I will be delighted to be able to give them more funds. “The North East of Scotland has been my political home since I entered representative politics. There was never the slightest possibility of me standing anywhere else but in this wonderful part of Scotland. “The first is to ensure that we rally round the local National Health Service under its new leadership. No- one should make irresponsible claims that patient care has suffered over the breakdown of relationships between management and senior staff inn Grampian Health Board. It hasn’t, but only because of the commitment of our local health workers. “Therefore the task is to get behind the new management and staff and support our local health service. The North East was underfunded for a generation under Tory and then Labour/ Liberal administrations, under the discredited Arbuthnot formula. Now the North East’s share of Scottish health funding has moved from 9.1 to 9.6 per cent the fair financial platform is in place to deal with local staff shortages. We all need to rally behind the local health service. “The second challenge is on transport. After decades of underinvestment the AWPR is now on track while the enhancement of the Aberdeen/Inverness railway offers many local opportunities. The North East will dominate the Scottish transport budget over the next few years. That is how it should be to redress the balance of the unfairness of the past. Locally we need to secure key investments in the Inveramsay Bridge, the Inverurie ring road and the duelling at Balmedie. This will give us the transport infrastructure which we need to broaden the base of the economy to ensure continued prosperity. “The North East also faces a jobs challenge. We are a prosperous area but the likely impact of a period of low oil prices will be to cost us local jobs in the short term. It is important therefore that our companies diversify into other energy markets, that our traditional industries of farming, food, fishing and tourism are well supported and that the investment in our public infrastructure in education, training and transport connectivity takes place to allow the area to move forward. “The behaviour of the London Treasury this week demonstrates why Scotland needs to turn Westminster upside down. Osborne and Alexander offered very limited proposals for tax relief to encourage exploration in contrast to their rapid smash and grab raid in 2011 when prices were high.